Finally, the friendly comprehensive reference tool every woman is looking for has arrived. Find answers to all of your personal finance questions, from the simple (Whats a good credit score?) to the complex (What are my options in retirement planning?). This books question and answer format means you dont have to waste time reading every word cover to cover. Biblical references offer proven wisdom from God, and Carolyn Castleberrys practical guidance is easy to implement. Success is simply turning obstacles into opportunities. And that begins with obtaining information that, thanks to this book, is clear, easy to find, and non-intimidating. Carolyn Castleberry, quickly becoming one of America s most trusted names in Christian broadcasting, provides you the answers you seek in every area of personal finance. With her warm, conversational style, Carolyns "there are no dumb questions" approach makes difficult concepts come alive &hellip; and more importantly make sense (so that you can make the most of your dollars). Honest, straightforward, and easy for anyone to apply, these "answers" stem from a biblically and financially sound foundationproviding the perfect conditions for success. Whether you are looking for freedom to make new career choices, seeking financial security and peace of mind, or youre on the lookout for the next solid investment, Women, Get Answers About Your Money harnesses timely, unique information to empower your life. 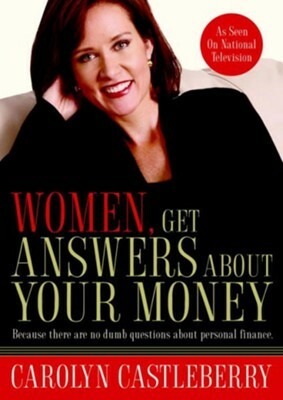 I'm the author/artist and I want to review Women, Get Answers About Your Money: Because There Are No Dumb Questions About Personal Finance - eBook.